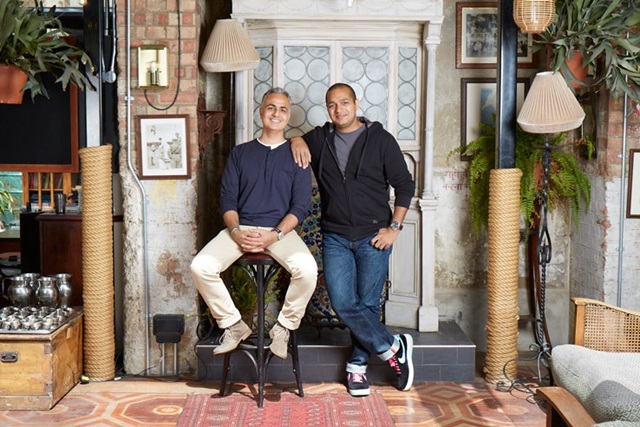 Shamil and Kavi Thakrar, the duo behind the incredibly successful chain of Indian restaurants Dishoom, are sitting in a booth in their huge Kings Cross restaurant. They are, as they call themselves, the chief wallahs behind this highly-respected and much-loved foodie destination. They have won many plaudits, but not just for their food. For, as they point out, behind every successful venture are the staff, the men and women who work for them from front-of-house to the bar staff, waiting staff and, of course, the many chefs who toil away behind the scenes creating such memorable Dishoom dishes as Vada Pau, Black House Dahl and Nalli Nihari – the Kings Cross speciality with option addition of fried brains. “Our staff and their welfare is terribly important to us,” says 45 year old Shamil, who used to work in the family’s former rice business and also studied business at Harvard. This is obviously true. While we sit and eat, everyone comes up to greet the brothers, from the staff to the punters, chefs to bottle washers. I ask a man behind the bar whether he likes his job. “I love my job,” he says. “It’s such a happy and inspirational place to work. I have so many opportunities and everyone who works here feels the same.” The brother’s ethos is if you run a happy ship, you have a successful vessel that can survive the ups and downs of a precarious business world. To keep everything and everyone happy and contented, they offer yoga and music events with such notable people as Nitin Sawnhey and Claire Missingham. They are not averse to sending their workforce on mindfulness training days or bringing a happiness coach in to the kitchen to keep everyone contented in what they do. As Dishoom – a wider version of it – they host Holi parties where everyone throws coloured paint powder over each other. They bring in musicians and story tellers and everyone drinks chai and, later on, their speciality Indian-blended cocktails. They also celebrate Eid and Diwali, asking the happy partakers to tie knots of protection round each other. “Last Raksha Bandhan (a traditional celebration of brotherhood) we asked people of different faith, nationality of culture to tie a piece of threat around each other as a gesture of solidarity.” For every thread, the Thakrars donated a pound to Seeds of Peace, a charity that helps teenagers from conflict regions learn how to make peace. They found that 7,485 knots were tied and, this year, they hope for even more. Anything goes at Dishoom as long as it makes their workforce happy and their punters delighted with the result. They even have almost a cult status on social media with a tremendous amount of response form their devoted followers. Their attention to detail is quite mind-blowing. The brothers go to Mumbai (or Bombay as they call it) to research all the right furniture and the correct ‘look’ for each of their five restaurants – four in London, one in Edinburgh. Every branch of Dishoom tells a story – the Kings Cross one is about a young Indian man earing his fortune selling chai at a railway station, the Carnaby Street one follows a putative jazz musician just starting out and getting involved in a more louche side of London. In order to get the feel right – as well as the food – the staff at Dishoom get a trip every other year to Bombay. “We really want the people who work for us to understand the Irani culture,” says Shamil. Before launching the business in 2010, a group trip to Mumbai cemented the idea for how Dishoom would stand out in the crowded restaurant industry. The driving force was their shared experience of home-made Indian food. The restaurants have proved so popular that, in 2015, they came top in the Yelp! poll of the most popular restaurant in London, beating Heston Blumenthal’s Dinner. “When we first started out, we had no idea if it would be successful,” says Shamil. Kavi nods in agreement. “Yes, everyone thought we were mad!,” he says. Yet they were both convinced that Dishoom would work and, as the concept grew, so did the brothers’ commitment to an ethical working practice. “We absolutely knew we were not rapacious capitalists trying to eek he last penny our of everyone,’ says Shamil. “It’s not who we are.” So their work ethic continued to evolve and, not only did the Sunday Times name them as one of the top 100 employers just a few months ago but they also have a strong charitable streak running through everything they do. Their net worth has been estimated at over ten millions pounds each but they plough that back in to expanding their restaurants, paying their staff properly, giving them good holiday allowance, yoga on tap, generous sick leave and pay, empatheeic bosses but, most highly-valued of all – a commitment to training and encouraging their staff to expand their knowledge of the industry and their role in it. This is partially whey they started the initiative a Meal for a Meal. “It started during Ramadan two years ago,” says Kavi. “For every meal we serve we donate a meal to a child who would otherwise go hungry. In order to achieve this, they are partnered with a charity in the UK and one in India. Their theory is that when hunger becomes a barrier to education, it is also a barrier to social mobility. “A child that Is not fed can become a teenager that did not learn,” says 38 year old Kavi. “That adult can stay in poverty and we care deeply about breaking down these barriers.” By the end of 2016, they had donated 1.7 million meals and that total will rise in 2017. “We think of Dishoom as our own world. ‘ Their world is a place in which where differences are celebrated rather than judged, a place full to the brim with Bombay food and culture. The food is fresher and tastier, the drink more thirst-quenching and the humour more eccentric. Their motto is, at Dishoom, you’re always amongst friends. “Our view is that it’s part of human nature to care about making people happy. We all care about this deeply. We call this Seva which means having a big, warm, open heart. And Seva means wanting to be fantastic – first-class – at everything you do.